Getting the most out of the mobile devices you bring to work. Do you understand the mobile devices you bring to work? Your mobile phone? Your tablet/iPad? Do you have ideas, knowledge or expertise – for example with particular device types (eg Android, iOS) – that you could share with others? Drop in to our mobile devices discovery clinic and discover what your devices can do. Bring your phone, iPad, etc – or try ours. Ask some one-on-one questions of our experts and learn how to find answers. We are exploring the concept of staff using their own mobile devices for work mobility and productivity – known as “BYOD” or “Bring Your Own Device”, this is an operational objective for 2017-2019. We are running a drop-in discovery clinic, to which staff can bring their own mobile devices and explore other models, with experts on hand to answer questions and explain features. UC Writer in Residence Karen Healey is kickstarting her new novel in a novel way. An award-winning New Zealand young-adult fiction author, Healey (Guardian of the Dead, the When We Wake duology) is teaming up with American writer Robyn Fleming for her first effort at self-publishing – aided by a Kickstarter campaign to raise funds. The book, a high fantasy novel titled The Empress of Timbra, concerns two half-siblings who meet for the first time in their ruler’s palace, and are pulled into a conspiracy that threatens to destroy their homeland. Healey, who is currently an Ursula Bethell Writer in Residence at the University of Canterbury, says she and Fleming first wrote the novel a decade ago. “The book doesn’t fit traditional publishing categories,” Healey says. None of these works are expected to impact on any examination locations because of the isolated location of the warehouse and interior nature of the work. If you are at all concerned however, please email Project Manager David Wong. You’ll have noticed the hoardings going up around von Haast in preparation for demolition. The contractors will work from 7.00am to 6.00pm Monday to Friday and from 7.00am to 4.00pm on Saturdays. As demolition proceeds, dust will be managed on site with water as required, however it is unavoidable that some noise and vibration will be felt by those in the immediate area. If you find yourself adversely affected by noise, please consult the Health and Safety options for managing Noise at Work. Extra truck movements will be restricted to the SBS car park and Forestry Road out to Creyke Road, with no impacts expected on the wider campus. During the first phase of demolition (late Nov – Dec) a temporary diversion of the north/south accessway through the Engineering Core will be required. Signage will be in place to indicate the detour. The demolition is expected to be completed by mid February when the hoardings will be reconfigured in preparation for construction of the new building. Please contact the Project Managers Mark Homewood or Mary Watson with any concerns. Having already completed a Bachelor of Science (BSc) and a BSc (Hons) majoring in biochemistry, Michael is furthering his expertise by seeking to understand the molecular details of proteins. Looking at their structure, function and how they interact in a pathway with other proteins, he hopes to increase scientific understanding in the fields of food processing, medicine and disease. “Proteins are ubiquitous in nature and are involved in many roles in a cell,” he says. 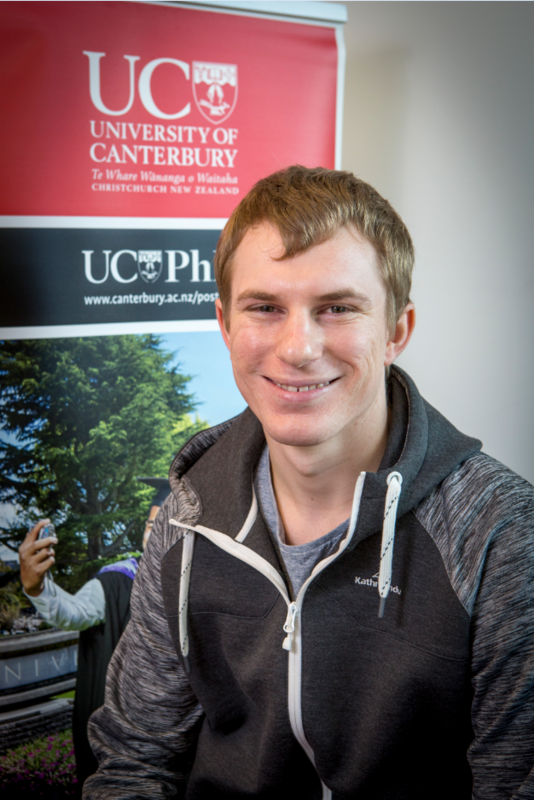 UC seemed the ideal tertiary institution for Michael. He had lived on the West Coast for 18 years, so in addition to being close to his home town, it offered a thought-provoking range of science topics. He began university life studying a mix of geology, biology and chemistry in his first year, specialising in biochemistry from his second year on. “What I have enjoyed most is carrying out real research in a laboratory setting. Michael’s supervisors are Associate Professor Renwick Dobson at UC and Dr Michael Griffin at the University of Melbourne.